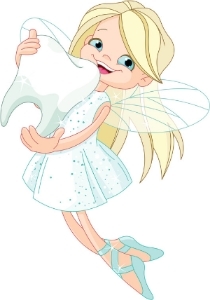 The tooth fairy is probably the best mythological character that best embodies the many physical changes that occur in the body during childhood. This is most probably why parents often go to great lengths at keeping the tooth fairy mythology alive in the minds of their children during their formative years. In true secret agent fashion, parents expertly slip their hands underneath the pillows to recover that precious baby tooth— leaving a money bill or two, as reward or consolation. This myth and the practice that generally goes with it are typically similar across the Western world, including Australia, England, Canada, and the United States. The tooth fairy mythology and practice as we know it today has not been around for very long. In fact the practice of hiding a fallen baby tooth underneath a pillow was only popularized in the early 1900s. Before the 1900s, the common practice was to bury baby teeth in the earth. Parents do this out of fear that witches might get their hands on baby teeth, and that when they do, they might used them to place a curse on the child. Quite similarly, early European cultures would bury baby teeth in the ground in the fear that magical animals would eat the teeth — and that the child would grow a set adult teeth that resembles those of the wild animal. Eventually, as the world turned into its more modern pages, the ancient tradition eventually became the baby tooth-tucked-underneath-the-pillow practice that most of us today are familiar with. And while the tooth fairy mythology is something that we all grow out of, the truth remains that our teeth are precious. In reality, the truth is a lot simpler. Religiously practicing good dental habits best increase your chances at keeping you teeth and gums healthy, even during the later stages in your life. At home, good dental habits easily translate to brushing your teeth at least twice a day with fluoride toothpaste, using high-quality mouthwash, and rinsing using dentist recommended mouthwash. Needless to say, even with faultless home oral healthcare practices, it is imperative that you visit your local Dentist In Bondi at Bondi Dental. Bondi Dental is a reputable dental practice that sits in the heart of Bondi Beach. Already with a community presence of over 30 years, Bondi Dental continues to provide only world-class dental solutions to the local Bondi community and its surrounding regions. Claim your FREE dental consultation by calling us at 02 9365 7187.